Marvel’s The Best Defense began this week, and it’s shaping up to be an exceptional mini-event that delivers rich character development with a compelling, unpredictable larger narrative. The Best Defense is composed of four one-shots spotlighting individual members of the original Defenders team—Hulk, Namor, Doctor Strange, and Silver Surfer—and the two one-shots released this week are compelling explorations of what makes Hulk and Namor tick with creative teams that have a clear passion for the characters. Next week’s Silver Surfer: The Best Defense is the only one-shot written and drawn by a single creator, with Jason Latour bringing his distinct visual sensibility to a interstellar tale about Galactus’ shining herald. 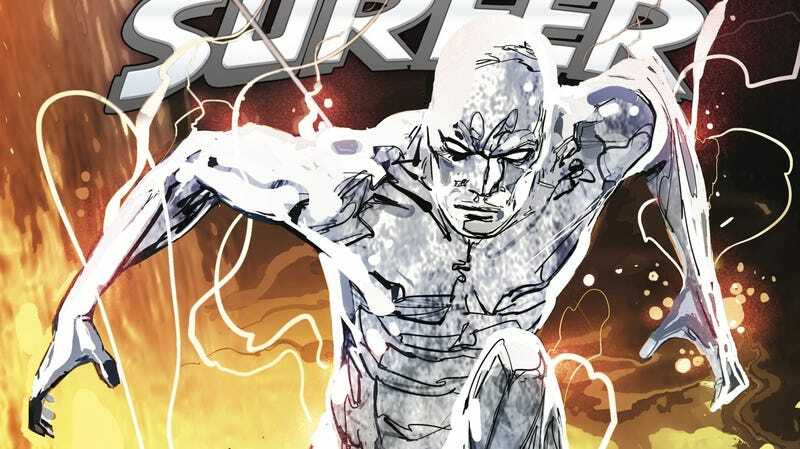 It’s a stunning book, and this exclusive preview showcases Latour’s immense artistic talent while offering a rugged interpretation of the Silver Surfer as a cosmic cowboy. These pages quickly set up huge stakes for the issue by emphasizing the godly power of Galactus, then challenging it with an explosion of color and light that sends planets careening through space. With the exception of Southern Bastards, Latour doesn’t do very much interior art these days, so it’s a treat to see him go wild with a story that is drastically different than the deep-fried crime noir of his Image Comics series. He gets to experiment with color, texture, and spectacular composition in his Silver Surfer book, and this excerpt is a feast for the eyes as it takes readers from a doomed pastel-colored alien metropolis to an arid desert where the titular hero discovers a wrecked Roxxon dig site. The way these pages shift from moments of quiet dread to planet-shattering action gives the story compelling tonal dynamics, and there’s a palpable sense of excitement in how Latour brings this cosmic corner of the Marvel universe to the page.